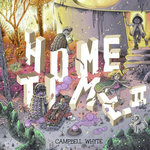 Campbell Whyte was born in Perth, Western Australia, wedged between a restless ocean and an endless desert. He began making things not long after and today, that rich tradition continues. 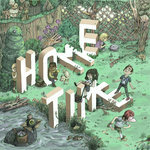 Home Time combines his love of the wild, video games, comics and art history into one big adventure. It's his first book. When not making comics, Campbell runs the children's art school Milktooth with his wife, son and their hairless dog.